Ebay is currently selling only fake and non functioning Radisafe. The public have have duped again. But buying a fake handbag or watch is one thing, buying a fake EMF protective shield for your cell or cordless phone is unethical and clearly dangerous. After all we are talking about protecting health, wellbeing and even lives. So watch out and be careful. 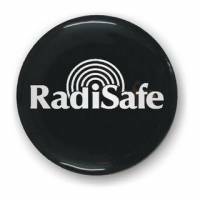 If your RadiSafe is offered at an unbelievably low price it is most probably fake. After all lumps of plastic in a cardboard sleeve are dirt cheap to produce. A bargain isn’t a bargain if it’s useless! Look for the hologram on the packaging of the RadiSafe, If there isn’t one, it is a RadiSafe copy – fake and useless. If the hologram is there, you are safe and can stick your RadiSafe onto your phone with confidence. Genuine on left has hologram and raised, embossed text. The fake ironically has “original” marked on it.